Comments: I am not sure if you are looking for input from the male side but here is my take. My wife and I have been together for 22 years. Some good some not so good but we’ve managed to weather the storm. SO FAR. To be 100% honest, there was a time I wasn’t sure I loved my wife and I wandered for lack of a better term. We got through it. I was just stupid and selfish. To her credit she took me back and we became stronger for it. For a short while. My wife is going to be 46 on her next birthday. About 6 months ago I noticed a small but noticable change in my wife. Her moods, she complained about her period being strange in it’s occurances and the inevitable hot flashes. Used to be that she was cold all the time. I’d be hot but she would be cold. Now it doesn’t matter. I will be buried under the covers and she has them off asking to turn down the heat, turn on the fan, telling me to get away from her because I’m too hot. She used to call me the human electric blanket cause she could snuggle up to me and get warm. I guess snuggling is out now. :). 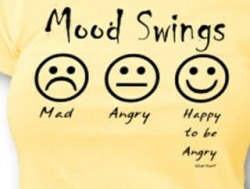 Anyway, the mood swings are more frequent as are the hot spells. Out of the blue this past Tuesday she told me that she doesn’t love me anymore and that she has let go. Floored me, I’ve been a wreck all week. I’ve known in the back of my mind that it could be “the change” and even mentioned it to her. Not a good idea. She flipped out, “how dare you she says”. Then the next morning a hug and a kiss before I left for work but no words. Last night she was crying and I asked her why. She says it is hard to let go of someone. This morning, another hug and kiss before work. This is turning into a very confusing time for me. I am madly and deeply in love with my wife. I want to help but I feel that my help must be covert and very behind the scenes. I am ordering a book by a gentleman named Paul Selinger called Men Surviving Menopause with the Woman They Love. It is written by a man who went through what I am starting to see. Only I think his ended up in divorce. Very sad. We have two daughters aged 8 and 10. They are my life. I tuck them in at night and get them up in the mornings to help get them ready for school. I think, no I know that my wife loves me but I’m afraid. Afraid of irrationality and maybe some sort of rash decision based on emotion instead of logic. I need help getting through this but more importantly helping her get through this. Since I’ve never done this I feel like I am in total suspended animation. Don’t know what she is going to say or do from one moment to the next. I know that some women breeze through it and some women have the toughest time with it. I’ve always sort of known that she would struggle with it, I just didn’t know how much. I’m prepared to see this through to the end, hopefully a happy end. I don’t want my family to suffer from this and I need any help I can get from people, books or general education. That is my story. HELP!!! Finally we are realizing how hard menopause is on the spouses, partners, and family of the menopausal woman, not to mention what she is going through. It’s a really rough time for everyone. How did our parents survive without talking about it?? I went through menopause and am now in post-menopause (it doesn’t stop for a long time), and I finally had to do something humorous before I killed my husband or vice-versa. I’m not minimizing the seriousness of this, but I’ve found that humor is one of the best therapies to help lighten up a potentially tragic phase of a family’s life. I’ve written a small book called “How NOT to Kill the Woman You Love: Your Guide to Surviving Her Menopause.” It does deal with the serious symptoms but also gives you humorous tips and tricks (in 10 easy steps) for coping with all of this. I hope it brings a little smile or two in addition to urging serious attention to menopausal symptoms. Information on the book can be found on my web site, http://www.labacciana.com, and the book is available on amazon.com. Good luck, try to find some humor, and hang in there!! Many of these symptoms will pass.